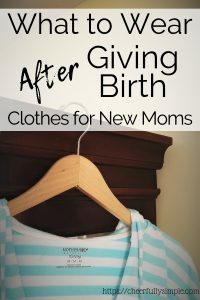 After giving birth, there’s this really awkward postpartum clothing stage when you’re trying to figure out what you’re supposed to be wearing. You may not want to wear your maternity clothes, but your regular clothes may not fit yet. It can be hard, and actually, it can be emotionally trying. Embracing your postpartum body can be mentally debilitating. You just want your pre-baby body back. For most women, you don’t bounce to your postpartum body right away. Many never get back to that. But in this season of the post-pregnancy body, you need a post-pregnancy wardrobe that is functional, yet attractive. When I had my kids, I just wanted to be comfortable. Sure, when we went out, I wanted a couple of cute pieces in my wardrobe, but overall, I was looking for functionality. I was a new mom who was figuring out nursing and trying to adjust to this new body I had acquired. But one thing that made a difference was the clothes I would wear. The cute clothes that made me feel slightly like my pre-mom self. In an effort to help you through the awkward stage of postpartum clothes, I have gathered some of my favorite clothes I have either purchased myself or would want if I had another baby. If you’re in the market for a gown to deliver in, check this out! I thought you had to wear the hospital gown because that’s just what you do when you’re in the hospital. And some hospital may require that you do. But if not, this amazing labor and delivery gown is fantastic and from what I see, it does everything the hospital gown does without feeling sterile. For starters, this gown opens up in the front from the waist all the way down. Perfect for the delivery part. The back has snaps down it for easy access which is important if you need to wear a fetal monitor, or if you need an epidural. And then, when you’ve delivered the baby and you’re ready to do skin to skin, the top part of the dress unsnaps at the shoulders and you can place the baby right on your chest. The snaps and access to your chest are also perfect if you’re planning to nurse. So, even if you don’t want to wear it while delivering the baby, it would be great to change into once you’ve cleaned up a bit. It’s certainly one of my favorite after birth dresses! With 17 different patterns to choose from, grab a couple and have options for yourself. Many women even wear these as a nightgown which is an awesome idea! There are only two sizes to choose from ranging from size 2 to size 20. As if all of these awesome features weren’t enough, you can get a matching robe, and a matching baby outfit for your newborn baby too! The reviews are positive, but kind of all over the place. Some women like one feature that others dislike. Truly it depends on which features are most important to you. Overall, this was one of the most popular and highly recommended nursing and delivery gowns I found. At the top of my list for the best postpartum pants would be this super cute and comfy pair of drawstring lounge pants. One of my favorite things about this pair of pants is the drawstring feature. You really have no idea what share your belly is going to be in after having a baby. This drawstring feature is going to accommodate your postpartum needs. The waist itself is elastic which is going to offer a bit of support to help keep your pants up but shouldn’t feel too tight to where you’re uncomfortable. There are MANY different prints available for this pair of pants which means you can buy a few different pairs and be set for a couple of days. Some of the prints do have a more “pajama” appearance, but there are plenty of prints that appear to be more like pants you’d feel OK running to the grocery store in. As with any pair of pants you’d buy online, it can be hard to know the right size you’ll need. The sizing information they provide is descriptive and amazing! You’re sure to find the size you need, everything from small to XXXL. As for the reviews, they’re awesome! The pants are true to size, there’s minimal if any shrinking, and they keep their shape well. They can be worn during your pregnancy, but they’re also great if you’re wondering what to wear after labor. Some of the reviews claimed that the length was a little bit too long, not nothing that can’t be hemmed easily. Of all the items I share here, these have been the most popular and most-ordered by far! If they look like something you’d want to wear, you aren’t alone in that! If you’re a Victoria’s Secret lovin’ momma, I’ve got you covered. The Boyfriend Pant is the perfect pair of pants for the postpartum mom. The waist has a drawstring making it easy for you to adjust the waist to meet the needs of your changing mid-section. They are relaxed fit which adds an extra level of comfort in case tight fitting clothes aren’t working for you. They’re made of lightweight fleece which makes them wearable for every season. You have the choice of 6 colors in case you need more than one for your postpartum wardrobe. When it comes to size, the reviews from most say they fit true to size. Many women love how comfortable they are, and how awesome they fit. If it makes you feel better, you could always order a size up from what you wore pre-pregnancy and have the comfort of the drawstring to adjust as needed. Some of the reviews had a concern related to the crotch area sagging. Honestly, this may not be a bad thing if that is the case, because, for the first week or so, you’ll likely need to wear thick pads. That extra room may be to your benefit. What’s an awesome gift for new moms? Check out how to make a self-care package for new moms! Another awesome pair of comfy pants to add to your postpartum wardrobe. These Gilligan and O’Malley jogger pants are designed with comfort in mind. They feature a drawstring waist which is helpful as your figure adjusts to not being pregnant anymore. Comfortable enough to sleep in, yet versatile enough to leave the house, you may want more than one pair. Lucky for you, there are 4 colors to choose from and 6 different size options. The fabric is a Rayon-blend which offers breathable comfort, which can be helpful as your hormones are adjusting. Overall, the reviews were really positive. They are comfortable, and they fit well. One of the greatest concerns of several people is that the pants started to have holes in them after just a couple of times being worn. Some had no issues with this being the case on their pants. Still, it’s something to keep in mind. As a new mom, you can feel frumpy at times. Even in the hospital, I felt “clunky”. It was awkward, I had a c-section, there was a lot going on with my body, and I was trying to figure out how to nurse. And yet, when I had visitors, I wanted to feel pretty. This nursing friendly dress is great while pregnant, but it’s also great for after giving birth. The hospital gowns you get the pleasure of wearing in the hospital are unattractive and look sterile. Having a nursing dress that is comfortable and functional can make any mom feel pretty. Even if you choose to not wear it right after giving birth, it’s a great piece to add to your postpartum wardrobe. There are 4 colors to choose from, and you may want all of them! One nice feature of this dress is the tie. When you’re pregnant, you can use it as a front tie to feature your pregnant belly and add an attractive visual flair. Once you’ve given birth, you may want to hide your tummy a bit more, and you can use the tie in the back instead. I read through many reviews, and most were positive. Here’s what they had to say about this dress. Many people share that the dress is thin, and you may want to wear something underneath it. The fit is good, although, for some, the length was a bit long. It is easily accessible for nursing moms to nurse their baby, but doesn’t look like a nursing dress. The dress is reasonably priced for what it is. And, considering it is a piece you can wear both during pregnancy, and in the postpartum stage, you will certainly get your wear out of it. Related Post: What Does the Hospital Supply When You Have a Baby? If there is one must-have piece that I think every new mom needs in her postpartum wardrobe, it’s a set of really great nursing tank tops. It doesn’t matter the time of year, so just because you’re having your baby in the winter months, don’t discount this. I had my first in September, and I wore a nursing tank top every day. I bought my first set of nursing tanks from Motherhood Maternity because I wanted to try them on. This tank is similar to what I had, except I think they’re even better. I like that the front is gathered in the front, making it more attractive than a straight fitted top. You could easily dress this up with a necklace and a jacket style sweater over top. Or, you can do what I did and just wear the tank while lounging at home. Either way, they are a cornerstone piece I think every postpartum mom should have, especially if you plan to breastfeed. An awesome feature of the tank top if the loose waistline which is going to help hide the tummy area. They’re made of cotton and spandex which means they’ll be super comfy. Some of the reviews did say that the fit isn’t great for everyone because the fabric isn’t as flowy as they would prefer. Others had no issue with it. As far as fit goes, they seem to fit true to size. Many like that the back isn’t plain and it has a design that some women claim makes them feel sexier, even after having just given birth. As I have mentioned for several of these items, they may be labeled as a “nursing _____”, but it doesn’t mean they aren’t going to be awesome for you even if you aren’t nursing. This adorable poncho is a great postpartum wardrobe item for every new mom. Not only is it cute, but it’s functional, and that’s the name of the game after having a baby. This poncho is one size and comes in six different patterns. The fabric is a soft stretch fabric that is breathable and great for nursing moms. If you haven’t nursed a baby before, a lot of women feel more comfortable nursing in public if they’re covered, which often involves a nursing cover or a blanket. This poncho alleviates the need for that because it doubles as a nursing cover. The back of the poncho is flairs open, so you’d want to make sure you wear a nursing tank or a shirt underneath. As if all of those features weren’t enough, it can be worn during pregnancy as well! The reviews for this poncho were really great. A few women had issues with the length based upon their height, while others thought it was too big for short stature women. It’s truly up to you and how you feel about it. Seriously, I had buyer’s remorse after having my first because I passed up one of these sleeping sets before giving birth. I had no idea what to wear after giving birth in a hospital. In fact, I thought that because I was in the hospital, I had to wear the hospital gown until I was allowed to go home. Surprise- you can wear whatever you want, and I wish I had these! I love that these pajamas are attractive and functional, which is exactly what you need as a new mom. These pajamas are attractive and have 3 pieces depending on your needs. If you’re just home from the hospital and you have guests, you’d likely want to wear the cardigan. But if you’re just lounging around, the cardigan wouldn’t be necessary, yet you’re fully clothed. The tank top underneath the cardigan is designed with breastfeeding moms in mind. There is easy access to breastfeeding your baby. The pants have an adjustable waistband as well. If you’ve already had a baby, or if you already have a decent amount of baby clothes, you may have already seen a waistband like this one. There are two tabs on either side with buttons and a swatch of elastic inside the pants. You pull the elastic to your desired fit and then button the elastic on. 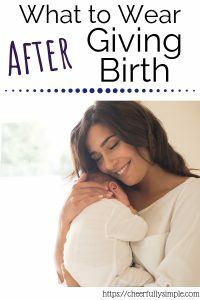 This is an awesome feature because your belly and your waist will change after giving birth. A high majority of the reviews are very positive. Those who have purchased these have been pleased with their fit both during pregnancy and postpartum. There were a couple of concerns that to me seem to be issues based upon the wrong size being purchased. There weren’t many that had any issues with the quality of the item itself. Thankfully, this “what do I even wear” stage doesn’t last forever. It’s totally OK to not love your body right after having a baby. It took 40 weeks to grow your precious baby, and your baby is likely going to show that. Find some comfy pants and shirts, and give yourself some time to recover. Buy a few new pieces for your postpartum wardrobe and love wearing them! What was/is your FAVORITE postpartum wardrobe item? I love all of these suggestions!!! You’re making me want to go on a huge shopping spree. LOL! 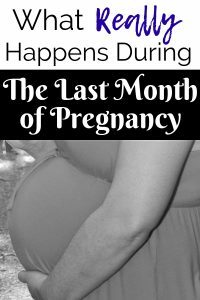 When I sat down to write this post, I realized that I have more maternity clothes in my closet still than I thought. Oops! They’re just so comfortable! 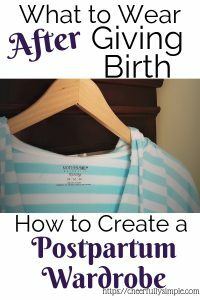 This is a great roundup of postpartum clothing! After my son was born, I loved wearing stretchy, loose-fitting dresses. For that matter, I still love wearing those! This is totally me too! 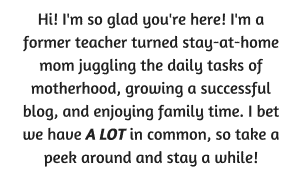 When I am just around the house, I find myself still wanting to be comfortable so that I can move around easily with my kids. If that makes me “frumpy”, I’ll take it! I loved wearing my nursing tank tops with cozy cardigan sweaters because they were comfortable and made it easy to nurse my daughter. The lounge pants you shared look so comfy! There are so many cute clothes out there that it is hard not to spend a fortune! Great selection of postpartum clothing options! There are indeed a LOT of options out there. The key is to find quality clothes that can be worn often and will still last a while. I have a couple of key wardrobe items that I still love! No shame! I’ll take one of each please! Seriously though, we often forget to take care of ourselves. We spend 9 months prepping for baby and neglect to remember that we will have certain needs too. I didn’t realize this either! As a new mom, so much of our focus is on our baby, and we forget that we have needs too! Sounds about like what I did! Thankfully, I was able to fit back into my pre-baby clothes which helped my self-esteem a lot. But comfy clothes all the way! I have the same draw string pajama pants and they are AMAZING! I love this list. I wish I knew my body wasn’t going right back to normal after having a baby. I still had to wear my maternity clothes for several months! 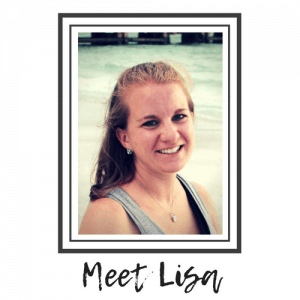 Each of my pregnancies was different, the deliveries were different, and the recovery was different. We have to give ourselves grace and remember it took our bodies 10 months to change and grow the baby, and it will likely take a few months to get it back.